In 1915, Frank W. Rumreich moved to Mahnomen, Minnesota from Montana. He opened a grocery store with a partner, Frank A. Bastyr. Bastyr had come to Mahnomen with his parents in 1911. The store opened on May 8th, 1915, in a building owned by John K. Rumreich. It was called The Bargain Store. As was typical of many general stores of this era, especially in the Midwest, merchants issued tokens to pay farmers for their produce in order to save bookkeeping and to provide change in remote rural areas far from banks. Farm workers tokens - pickers and peelers checks - blossomed during this period. The brass tokens below are examples of those issued by the Bastyr & Rumreich store for this purpose. After his brief stint in the grocery business, Frank Bastyr became a livestock buyer (1917-1929). He started a turkey dressing plant and later a hatchery business. Frank W. Rumreich continued to operate the store until his death in 1922. At that point, Frank's oldest son, Felix M. "Tubby" Rumreich (then 17), took over the business. The newspaper ad to the right was from this period. 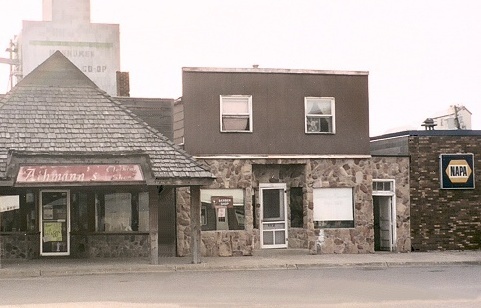 The store later became known as Tubby's Grocery. In 1928, the store was expanded by converting the warehouse to a part of the main store, adding nearly fifty percent to the floor space. Felix operated the grocery until his death in 1967. The building for the store is located at 112 South Main Street. As the early years of the 20th Century progressed, the invention of the washing machine was replacing the old fashioned and exhausting method of washing laundry by hand. To go along with the modern times, Procter & Gamble created Chipso, the first soap brand specially made for washing machines. Instead of using a grater to create chips from a bar of soap, all that was needed was to open a box of Chipso and pour the chips into the wash water. This was wonderful news for fingers that would otherwise risk being injured on the unforgiving soap grater.